Studio Stuff: Happy Birthday Papa! Tonight Sheila brought out the twins to wish Papa a Happy Birthday! They each had made him a card showing signs of budding artists:) They loved blowing out the candles as well as the lasagna I had made for the occasion. 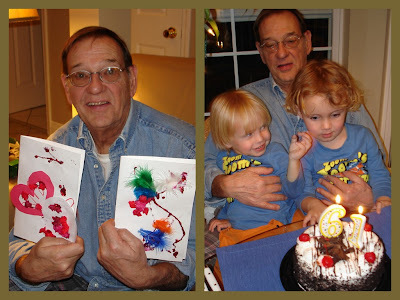 We all enjoyed cake and ice cream as Papa accepted the role of a 61 year young grandpa! Hey Wish from me too.Happy Birthday.